"I just want to take a minute & thank you for everything you do. You are an amazing doctor & you have an amazing staff, which I love. You all made this pregnancy great for me. Not many women say they enjoy going to their OB/GYN but I do. So again, I just want to say a big thank you to you and all the ladies. I'm very blessed." "I can't begin to thank you enough for all you've done for me. I had just about given up on becoming a mother when someone suggested I come and see you. And sure enough, you held true to your word if I wasn't happy you weren't happy! It was a long journey, but you and especially the entire staff was always their answering my 50 questions and cheering me on. Everyone reassured me things would be Okay and now when I look at my BEAUTIFUL son, I thank god for bringing me to you and the EXCELLENT Care I received. From the bottom of my heart... Thank you for finally making me a "mommy". I really couldn't have done it without all of you. Thank you!" Albert T. Domingo MS, MD Inc is an Obstetrical/Gynecological and Internal Medicine Practice that is strongly committed to the health of all people of our community. By focusing on wellness and preventative care, our well-respected staff is comforting and compassionate in their approach to each patient's needs. You can trust that you will receive highly personal and individualized care, fully supporting you through your treatment process. 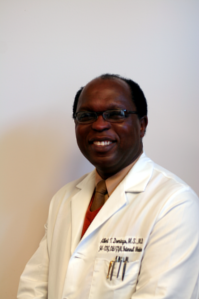 Dr. Domingo is board certified, and specializes in Obstetrics and Gynecology, and has full privileges at Aultman Hospital, Mercy Medical Center, and Affinity Hospital. Dr. Domingo was the first, and has been the only, MD to be honored with this award. ©2009 Albert T. Domingo M.S., M.D., Inc. All rights reserved.